What is a labyrinth? Find out! Annual Auction is Now Open! The 2019 Online Auction will run from April 7 - 28. This action-packed event provides a fun and engaging way for members and non-members around the world to support our organization through bidding and donating. Items will continue to be accepted through the event. Any donated item or service, large or small, will be appreciated. Exploring the burgeoning interest in labyrinths, The Labyrinth Society presents Many Paths, Many Visions, a live podcast show highlighting guests from around the world who use labyrinths in their work, art, and personal lives. Go to the MPMV webpage to see the upcoming podcast schedule, the link to join the next podcast live, and the archive of past podcasts. The Labyrinth Society's special 20th anniversary digital publication could make a wonderful holiday gift! 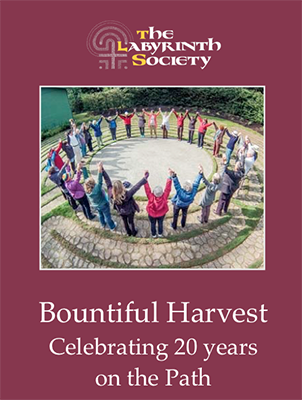 Bountiful Harvest: Celebrating 20 Years on the Path is available in both iBook and PDF formats. See Digital Publications under Media. View a YouTube clip below, rent/buy a digital copy or order the DVD. Learn about Regional Reps, find one, or become one! Discover the TLS 365 Experience for inspiration and ideas for walking the path. Browse our educational and experiential resources for the labyrinth community. Click to shop all of Amazon and support us with any on-line order!